More than any other country in the world, NZ’s gross emissions are influenced by methane-producing ruminant animals. No other developed country has a comparable emission profile, with the arguable exception of Uruguay. Accordingly, the issue of methane accounting, which is crucial to us, really does not matter to almost everyone else. So, no-one else will lead on this one. It is up to New Zealand to lead the debate. That means bringing some intellectual grunt to the issue. At the heart of the issue is the concept of flows and stocks of the various gases. In the case of methane from all New Zealand sources (but predominantly ruminant agriculture), the flow of emissions into the atmosphere is now lower than 20 years ago, having peaked in 2006 at 35,915 kt of CO2e, declining to 33784 kt of CO2e in 2016. The other key metric for determining the net flows and pools of methane is that the atmospheric resident time of methane is 12.4 years (calculated, for those who are mathematically minded, as a logarithmic decay function). This means that half of the warming caused by methane as a greenhouse gas occurs within 12.4 years, and about 94 percent within 50 years. Bringing these metrics together, the current situation for methane from New Zealand sources (largely pastoral agriculture) is that the amount of methane entering the atmosphere is approximately equivalent to the amount that is leaving via conversion to carbon dioxide and then back into grass and related feeds via the carbon cycle. Given that inflows match outflows, then atmospheric heat sources are being lost as fast as they are being gained. In contrast, carbon dioxide is largely a stock resource. Every time we produce more carbon dioxide, largely from burning fossil fuels, it stacks up in the atmosphere in amongst all the carbon dioxide that is already there. It takes some hundreds and even thousands of years for the extra carbon dioxide to be dissolved in the oceans or converted into inert forms, such as new coal or oil. This means that if we keep burning fossil fuels at the current rate, then the world will continue to get hotter. Even if we reduce the burning of fossil fuels, the world will, all other things being equal, continue to get hotter as the stock of carbon dioxide in the atmosphere continues to increase. And even if we stopped all use of fossil fuels, then it would probably be many decades before we would see a meaningful decline of atmospheric carbon dioxide. And there lies the nub of the issue. Methane from ruminant nutrition is essentially a flow resource, which flows in and out of the atmosphere, whereas carbon dioxide is a stock resource that keeps on building up. For those who like bathtub analogies, in the New Zealand methane bathtub the tap and the plughole are in balance. For the carbon dioxide bathtub, the tap keeps flowing faster while there is still only a dribble coming out the bottom. These concepts of flows and stocks are embedded within modelling techniques called system dynamics. Developed originally in the 1960s by American Jay Forrester, I used these techniques within my own PhD a long time ago – but not quite that long ago! I used them in a biological context, although the principles are the same as is needed to model flows and stocks of GHGs. Recognition that short and long-lived GHGs need to be considered differently has escaped both policy makers and the general public. Our current Commissioner of the Environment stands out for his recognition of the issue, but he has largely been a voice in isolation. Nobody likes hearing messages that run counter to prior beliefs, and so I can already hear the howls of protest from those who want to do away with ruminant agriculture in general and the dairy industry in particular. So, let me identify the key counter arguments in advance. The first attack will be that the carbon equivalent system already takes into account the short-lived gas effect. The answer is that it does indeed do so in terms of comparing the gross emissions over a 100-year period, and this allows for the fact that the methane molecules are rapidly departing from the atmosphere over that time. But it does not take account of the net emissions (inflows versus outflows) and relative heating effects that are occurring at any point in time. To reinforce that point, what the current measurement system does not do is allow for the fact that methane does its damage quickly and then goes away. In contrast, whatever damage carbon dioxide does is long, drawn out, and irreversible. There is also a remarkable assumption buried within the current measuring system that we are only interested in the global warming potential for the next 100 years. This is called the GWP100. This means that we effectively capture all of the methane effects but miss most of the carbon dioxide effects because these relate to beyond 100 years. If we were to measure the relative effects of methane and carbon dioxide over a 500-year time period, then we would be saying that whereas each methane molecule equates to about 28 molecules of carbon dioxide within the GWP100 (the current best estimate), then that number is reduced to around 8 carbon dioxide molecules using a GWP500. The second argument is likely to be around the issue that, to quote Climate Change Minster James Shaw from a letter forwarded to me by its recipient: “There has been a 2.5-fold increase in global concentrations of methane in the atmosphere since the pre-industrial era”. Clearly, it would seem, we have to do something. What was left unstated in that letter was that on this global scale most of the methane has nothing to do with ruminants. Reducing methane leakage from oil and gas fields would be a good place to start. Another source we could work on would be from landfills and associated wastes, plus wastewater, which jointly contribute about 20 percent of the world total. Rice paddies are also a major source, but there is no current or likely solution to that issue. The third argument against what I am saying will be ‘ad hominem’. This is a standard approach of attack when someone says something that is controversial. The starting point is to criticise their credentials. As a personal example, way back in 2006 I wrote an article published in Primary Industry Management about this particular issue of 100-year versus 500-year GWP indices. The logic was irrefutable, so instead I was attacked in the media as not being qualified to talk on such matters. Unfortunately, there is no such things as Queensberry Rules when to comes to environmental politics. And that is precisely the reason that many people shy away from raising their head above the parapet. In a broader context, I have written about what I (and others) call ‘noble cause corruption’. These are situations where ‘advancing the cause’ is seen to justify one or all of data cherry picking, using data out of context, even fudging of data, and also throwing in some ad hominem attacks. Put simply, it is where desired and supposedly noble ends justify means. The bias can be either conscious or sub-conscious. The other part of ad hominem attacks is the straw man strategy. This goes along the lines of falsely arguing that the target person holds a particular stance, which is then destroyed as being built on straw. But in reality, the target person did not hold that stance at all; rather it was a twisted version thereof, with just enough truth to be credible to the uninitiated, so as to destroy the credibility of the target person. So, let me make my own position clear. Within the current context of the Paris Agreement, agriculture emissions are indeed important and that includes methane. Also, agriculture produces another gas called nitrous oxide and this is a long-lived gas. So, in a world that is worried by climate change, agriculture along with others does have to step up to the plate. Fortunately, there are some technologies we can use to nibble away at agricultural GHGs without destroying pastoral agriculture. In stepping forward to the plate, rural leaders must come to grips with the underlying science and associated GHG issues. These issues are indeed complex. We need to see more intellectual grunt and less emotion. This entry was posted in Agribusiness, Dairy, Land and water, Science ethics and communication, Water. Bookmark the permalink. The fourth way of handling inconvenient facts in this contentious issue Keith is just to ignore them!…Robin Grieve has been a ”lone voice in the wilderness” for many years and makes the same arguments you are making here but has got nowhere…most surprisingly farming leaders have not picked up on these arguments as you allude to. I could not imagine the same thing happening in the U.S or Australia by their farming leaders..is it a reflection on New Zealanders and their passive nature? Good article Keith. With you on this one all the way. Been fighting about the unequitable use of GWP100yr accounting metric for pastoral agriculture & developing countries. That is what NZ should be standing up for. David Frame also speaks about this. You know when a speaker doesn’t understand NZ GHGs when they throw out the ‘NZ agriculture is 48% of NZ emissions. It isn’t. It is 48% of emissions equivalents using this flawed GWP100yrs. You mentioned how using GWP 500yrs puts CH4 down to around 8x CO2. Using GTP 100yrs (Global Temperature change Potential) puts CH4 down to around 4x CO2. The other big impact is these emissions intensities are based on modelling. When Kyoto was signed CH4 was 19x CO2 using the GWP100yrs. Then it got lifted to 21. Its 25 now, soon to be 28, and work likely in place to make it up to 34x. Models have errors. Conveniently for most developed countries where CO2 is the biggy being the reference gas it says at 1x. I understand the current model error factor is around 20-30%. So the error margin alone of CH4 has big implications for NZ. We want to get to CarbonZero as a country. Best place to start is to know the correct level we need to offset emissions. 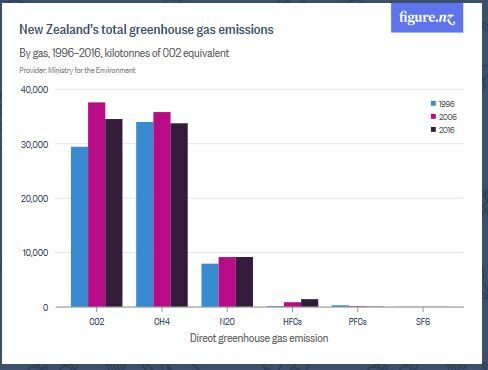 The NZ Government & our climate change leaders are looking at a number that is ~30% to high (based on CH4 being 75% of Agricultural emissions in current GWP100yrs, and changing this to using GTP100yrs). That saves a lot of short term carbon sinks (pine trees) from being planted in places they shouldn’t, and enables better environmental and long term options to be more of the solution, adding biodiversity, water quality and other recreational values. Thanks for sticking your head above the parapets. The ad hom attacks in the media have been ongoing against Dr Rowarth with no explanation about why her reasoning is wrong. I don’t know for sure but I believe she is correct about irrigation building soils up as I’ve seen it myself on the Waitaki Plains – thick soils where there were stones previously. It also gels with what I was taught. On the flip side Mike Joy is also subject to ad hom attacks although not usually in the open media. Also, it was pleasing to hear you on Radio NZ. I have long suggested to them they use you as an expert source. I agree with you re the effect of irrigation on soils. Twenty years of irrigation on Lismores or Eyres or similar and they are totally different beasts. But there is still a lot about soil carbon that we don’t understand. The Productivity Commission draft report on Low Emissions Economy states in reference to biofuels “The combined process of producing and consuming biofuels is often refered as carbon neutral since the CO2 emitted when combusting the fuel is equal to the CO2 the plants absorb as they grow”. The same treatment is not given to pasture that is consumed by ruminants, as gross emissions are the measurement used in assessing GHG emissions. I think there is a logic in relation to biofuels that is somewhat different than for methane. In that case, the emission and the uptake are occurring just a few months apart. But in the case of enteric methane, the methane is spending on average about 12 years in the environment. So we do have to take that into account, and we cannot say that enteric methane production is GHG neutral. But… that does not mean that it should simply be added to give a CO2 equivalent as that is indeed mixing apples with oranges.